TUCSON, Ariz. — Rillito Park Racetrack began sending out a signal of its races last weekend for the first time in the track’s history, much to the excitement of racing fans and University of Arizona alumni. Rillito’s races are available to watch on the Dish Network Racing Package, Racetrack Television Network and advance deposit wagering sites such as Twin Spires, Premiere Turf Club and Watch & Wager. This move was coordinated by Rillito Park general manager Michael Weiss and much of the show is produced by University of Arizona Race Track Industry Program students who can be found behind the scenes controlling TV graphics or on the screen announcing their handicapping picks. 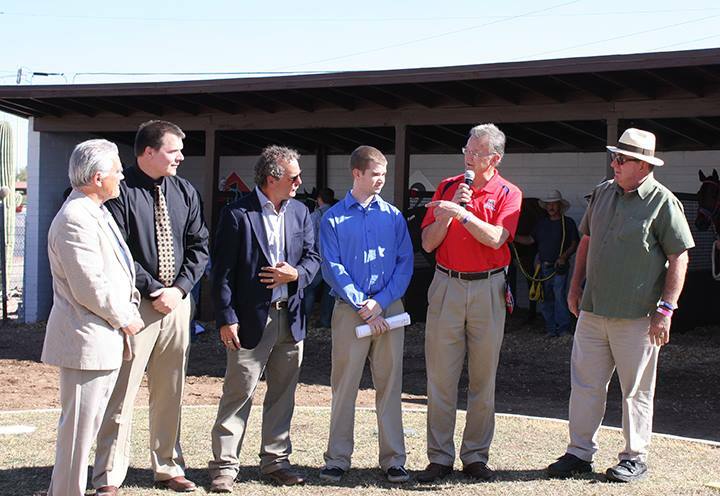 Students from the RTIP began working at the Tucson track last year with the introduction of a coordinated relationship between the program and Rillito. This year, even more students have secured positions at the track including working the photo finish timing equipment, creating the race program, working and managing admissions, and being the live talking heads on screen as the track’s handicappers. That was the exact purpose of this collaboration. Students are able to learn more first hand by doing projects related to the operations at Rillito during the week and then heading over to the local track on the weekends to work in a professional setting. According to Reed, the turn out proves how excited students are for this opportunity. Students from all backgrounds are thrilled to work at Rillito — even those who are fortunate enough to have personal backgrounds in racing. RTIP freshman Nick Fanucchi might be one of the best examples. His family owns Stonestreet Farms, famous for having the likes of Curlin and Rachel Alexandra grace its barn aisles. Fanucchi has been to the Kentucky Derby and the Breeder’s Cup and he can volunteer his time on the family farm when he wants to. Despite these opportunities, he jumped at the chance to work at Rillito while in college. Fanucchi works on the TV graphics and controls what images are being broadcast during the race day. Students are given the opportunity to hold different — even managerial — positions in a gamet of departments. Now with Rillito’s signal being introduced to the rest of the industry, they have one more facet to look at. “They’re learning advanced racing operations and now with the signal streaming, they can even study the effect advanced wagering deposit companies have on Rillito,” Weiss, who is also the president of Paribet.com, said. Despite being the birthplace of Quarter Horse racing and being known for accomplishments like the development of the photo finish, Rillito Park is a small track — and that is it’s best feature for the students. For Fanucchi and other RTIP students, this range of experiences may be exactly what they need to figure out what they want to do in the racing industry. Rillito Park Racetrack will continue its Winter 2016 meet running Saturdays and Sundays through March 20. Rillito’s live racing feed is available on the Dish Network Racing Package, Racetrack Television Network and advance deposit wagering sites.